PHP is known as the most popular server-side scripting language in the world. This language is known for its minimalistic character, simplicity, reusable components and faster development cycles. PHP is widely used in popular CMS like Joomla, WordPress, Drupal, etc. That’s not all. It’s also used to make Joomla extensions, Joomla templates, WordPress plugins, WordPress themes and many web related applications. To make the development process faster, this framework gives the user a basic structure with some pre-built modules. These frameworks maintain coding standards and development guidelines, standardize the process and stabilize the product. PHP uses MVC (Model View Controller) architecture, and MVC architecture helps developers to focus on a specific area without worrying if their code is adversely affecting the development of the other modules or not. Very easy to develop, upgrade and maintain your developed applications. Good security features such as output encoding and input filtering. Rapid development using the tools and libraries provided by the framework. Laravel framework was created by Taylor Otwell and initially released in June 2011. It is a free and open source PHP web framework. This framework is highly favoured and preferred by almost half of all the combined PHP users. Maybe its due to the MVC (Model View Controller) architectural pattern. This PHP framework consists of many developer-friendly videos and as well as course contents which are designed to guide the beginners through the entire process until completion. These screencasts are called Laracasts. Laravel is based on Symfony and intended to develop web applications. It has so many features that enable rapid application development. This framework comes with its own very lightweight templating engine called Blade. Blade facilitates tasks you frequently need to do, such as sessions, authentication, queueing, RESTful routing and caching. There is a local development environment named Homestead that is a Vagrant box and comes with Laravel. Laravel Dusk: With Laravel Dusk, a very expressive and easy to use browser automation and testing API is provided to developers. Laravel Horizon: Laravel Horizon comes with an elegantly designed dashboard along with a code-driven configuration that is perfect for redis queues. Laravel Echo: The evolution of event broadcasting came with Laravel Echo. The power of WebSockets for applications without any complexity or fuss is only possible for Laravel Echo. Laravel is a cross-platform where all of the source code is hosted on GitHub, and it is licensed under MIT license. CodeIgniter is an open source rapid software development web framework. It was created by Rick Ellis and initially released in February 2006. 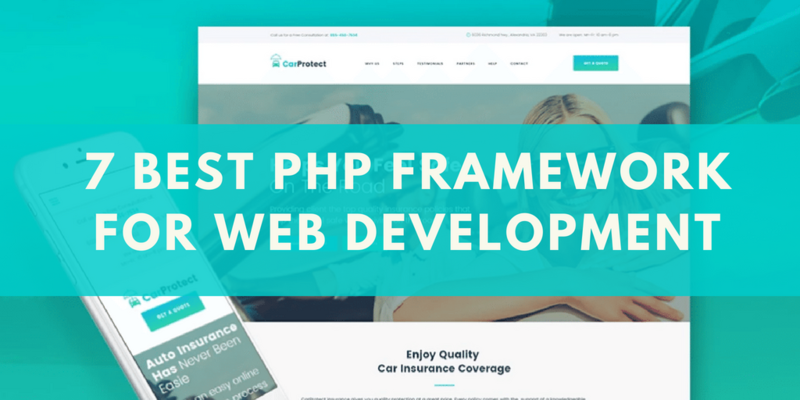 This powerful PHP framework has now been on the market for more than 12 years and is known for being the easiest to use of all other frameworks. CodeIgniter has a very straightforward and simple installation process that requires only minimal configuration. It works smoothly on almost all shared and dedicated hosting platforms. It is an ideal choice for avoiding PHP version conflict, and it is not strictly based on the MVC pattern. In this framework, using controller classes is a must, but Views and Models are optional. With CodeIgniter, you are allowed to maintain modular groupings of Models, Controller and View arranged in a sub directory format. CodeIgniter gives you freedom as you can use your own naming conventions and coding. A small footprint specially designed for developers in need of simplicity..
A strong security system with built-in protection against attacks like XSS and CSRF. Clear enriched documentation, tutorials, user guides and references. Exceptional performance capability that outperforms most of its competitors. Developer friendly Very few libraries which are built inside the framework. Symfony is a very popular PHP web application framework that was published as free software in October 2005. This PHP web application framework aims to speed up the development and maintenance of web applications. To replace recurring coding tasks, this framework uses a low-performance overhead with a bytecode cache. Symfony framework includes very large libraries which are reusable and known to allow authentication, security, configuration, creation and a host of other features. With the Composer PHP dependency manager, you can install any components. The website of this framework has a cool showcase section, where you can take a look at the projects, which are completed by developers with the help of this powerful framework. Includes 30 stand-alone components which are available for developers’ own applications. Speeds up both the maintenance as well as the creation of PHP web applications. Eliminates the recurring coding tasks. Phalcon was created by Andrés Gutiérrez. It is a modern PHP web framework which was released in 2012. This framework gained popularity very fast as it was written in C++ and C to reach the highest level of performance optimization possible. Afraid? Don’t worry. You do not need to write or learn any C language. All the functionality of Phalcon is exposed as PHP classes which are ready to use for any application. The architecture is optimized at a low level and significantly reduces the overhead typical of MVC based apps, as this framework is delivered as a C extension. This PHP framework not only boosts your execution speeds, but it also decreases resource usage. Phalcon comes with many exciting features such as asset management, autoloader, security, translation, caching and many more. As it is richly documented and comes with an easy to use framework, it is totally worth a try. Low overhead: It comes with both low memory consumption and CPU when compared to other traditional frameworks. Router: It provides advanced routing capabilities. Rest: Full stack or micro application are available to assist you in reaching your goal. Dependency Injection: It has the dependency injection along with the location of services. MVC & HMVC: This area contains Modules, Models, views, controllers and components. Auto loader: Autoloader offers autoloading of the PHP classes when following the PSR-4. Zend is a very stable and robust framework which was initially released in March 2006. It has a wide range of features which help to develop quality applications for enterprise clients. This framework is basically a collection of professional PHP-based packages. It comes with many configuration options; therefore it is not recommended for small projects but works well with more complex ones. Zend has partners such as Microsoft, IBM, Adobe and Google. This is an open source and object oriented web application framework which comes with license under BSD. CakePHP is a very old PHP framework which is very popular. Its first version was released in April 2005. A Polish programmer named Michal Tatarynowicz wrote a minimal version of a rapid application in PHP language and called it Cake. The framework published under open source MIT license and became available to the online community of developers. In December 2005, G.J. Woodworth and L. Masters founded the Cake software foundation to promote all of the development related to CakePHP. This framework was modelled on the concepts of Ruby Rails, and it follows MVC architecture. It supports both versions of PHP 4 and PHP 5. There is no need for configuration of complicated XML or YAML files. Scaffolding features enable the developers to build prototypes very quickly. It comes with built-in database access, caching, authentication, translations and validation. Contains a set of conventions designed to guide you while you are developing your app with CakePHP. Caching, Database Access, Authentication, Validation are built in Not very good for developing RESTful APIs as Laravel or others listed. Sinatra, Slim was created. The micro framework is excellent for developing smaller apps, where a full stack framework will provide you many redundancies. Slim is now popular and used by a lot of PHP developers for developing RESTful services and APIs. Slim provides features such as, client-side HTTP caching, URL routing, session and cookie encryption, plus it gives support for flash messages across HTTP requests as well. It also provides an easy guide for beginners, and if you want to test the upcoming features, you can join the beta program. A very small micro framework that consists of everything you need. Supports URL routing, flash messages across HTTP request. Excellent for developing small applications. Not that good for developing complex and enterprise projects. It doesn’t matter if you are a newbie or expert developer, the right tool will always help you to reach your destiny faster. Every framework that has been listed here is good and you can choose any one you want. But if you ask me for a recommendation, I will tell you to choose Laravel. If you have any queries, do not hesitate to ask. Just go at the comments section and let us know your thoughts. I am Abir, associated with themexpert.com for some time now. I like to write about everything related to web development.